Family Plot. Universal Pictures 1976. Five years ago this month, Yesterday’s Movies officially began. To celebrate half a decade of movie reviews, I’m rewatching some of the highlights and giving them second-look reviews. 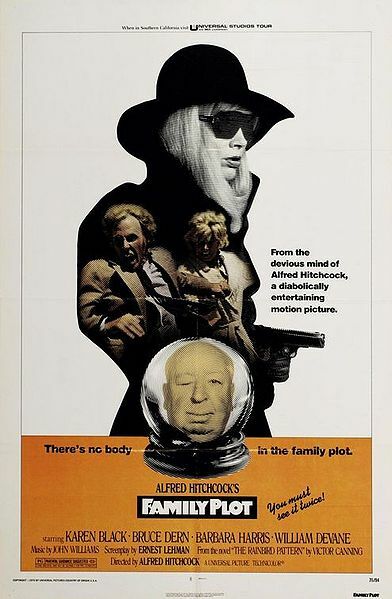 This week, I’m giving the unfairly forgotten Family Plot another try. In May of 2011, I was preparing to leave for an extended stay in another state, and I’d decided that my last review the night before leaving would be a family copy of Family Plot. However, shortly after I began watching the movie, I received word canceling the lodgings I thought I’d secured for my trip. I spent the next few hours frantically trying to make other arrangements, and while I managed to get a review posted, I probably hadn’t had enough attention to give it. Therefore, I always wanted to find an opportunity to give it another attempt, since it’s probably the film on this blog most deserving of a second look. That story is pretty much all of what I remember about the movie. It’s some kind of comedy about murder, but I think that much is stated on the box. Fake psychic Blanche Tyler and cab driver/aspiring actor George Lumley have got the perfect con. Blanche has convinced the elderly Ms. Rainbird that she’s psychically locating the lost last heir of the Rainbird fortune, and she and George (mostly George) just need to do some real detective work to find him. Meanwhile, jeweller Arthur Adamson and his girlfriend Fran are making themselves a fortune in ransom diamonds kidnapping valuable people, but as George and Blanche’s trail leads them closer to Adamson, he becomes more and more convinced they’re seeking his arrest. This still isn’t as funny as I was expecting. I found a lot more humor, but it feels like a thriller with characters who occasionally get to be funny rather than a funny mystery. I know it’s possible to blend the two much more seamlessly. For example, Foul Play comes to mind. However, it seems like while Hitchcock indisputably knows suspense and thrillers, comedy isn’t really one of his skills. One scene in particular stands out as one that seems like it should be funny, but isn’t, and the dissonance may come to the direction. At one point, George and Blanche find themselves speeding down a twisting hill road with a jammed accelerator and cut brakes, and while Blanche’s hysterics are almost certainly meant to be comical, the tension in the editing and the situation at large is very, very not funny, which just made her annoying. The comedy is so separate from the thriller that I think it’s much more possible to enjoy it as the latter rather than the former. It may not be as dark as most thrillers, but the suspense and intrigue is still quite present, and it is of course as carefully and beautifully made as anything Hitchcock did. Perhaps it can be considered a thriller for people who don’t like thrillers. I find it interesting that much of the best comedy is carried by Bruce Dern, who, judging from a brief look at his filmography, appears to be mainly a dramatic actor. He’s arguably playing straight man to Barbara Harris, who does have more comedy in her career, but the humor in Blanche is mainly rather easy, sexist jokes about her being irrational. William Devane’s performance is pretty threatening even in a movie too light for him to actually be dangerous. I can see him being really scary in a more serious work. It’s not at all pleasant to reread my old review. I was straining to come up with anything to say about it then, and it shows. I’ve never had to cancel a review after I started watching the film, but I just wasn’t present enough to give this its due. All the suspense and dramatic irony makes it a story impossible to bob in and out of. I often watch bad movies to see if I can redeem them. This week, I hope I’ve redeemed a bad review.